Cowin E7 is among the most affordable Bluetooth headset with active noise cancellation. And it has excellent battery life. So, when Cowin E7 Pro was released, people are wondering whether the new model is really better or not. Below, we’ll compare Cowin E7 vs E7 Pro to find out which model that gives the best value for the money. Let’s start by taking a look at the included items in each box. Actually, their boxes look very similar. Both come in black boxes that have white font. After opening their boxes, you will find that they also come with similar items. See also: Sennheiser PXC 550 vs Bose QC35. In each box, you can find the Cowin E7 headset or the Cowin E7 Pro headset along with a 3.5mm audio cable for wired listening, a Micro USB cable for charging, and a user guide. The audio cable is quite basic, but it works. Plus, it is pretty long, so it will be convenient to use when you can’t or don’t want to connect the headset via Bluetooth. Unfortunately, neither of them comes with an airplane adaptor. But we can’t really complain because these headsets come at very budget-friendly prices. Besides, you can easily find an airplane adaptor for the 3.5mm jack in the market. So, if you really need one, you can purchase it separately. In terms of design, Cowin E7 vs E7 Pro look quite similar. However, there are some slight differences. In addition, they also come with different color options. Cowin E7 is liked by many because of several reasons, and one of them is the sleek and minimalist design. It is compact and portable, very easy to carry around. It is also quite lightweight. It looks solid and sturdy, as the parts that connect the ear cups to the headband are covered with a metallic finish. However, most of the frame is actually plastic. Still, the build quality is really good. The metallic finish is a very nice touch. The headset looks modern and stylish. Cowin E7 is available in four color options, which are black purple, blue, and white. Cowin E7 Pro has slightly changed its appearance. It no longer conceals the plastic parts with a metallic finish. However, the ear cups’s backs are now metallic. Cowin E7 Pro still retains a compact, lightweight, and portable design, and the build quality is very good. The frame feels sturdy and durable. Overall, Cowin E7 Pro has a more streamlined look. In a way, it is more elegant. It comes with more color variants, so you have more options to choose from. There are six color options, which include black, green, red, pink, blue, and white. In terms of comfort, Cowin E7 vs E7 Pro are also quite similar. The new model still uses similar materials like its predecessor, so there is no significant change. Both models are really comfortable and enjoyable to wear. Cowin E7 comes with an over-the-ear design, so the ear cups are large enough to surround and cushion the ears instead of pressing onto them. The ear pads are quite thick, and they are soft enough to provide excellent comfort. As the effect, you can wear the headset for an extended time without experiencing fatigue. 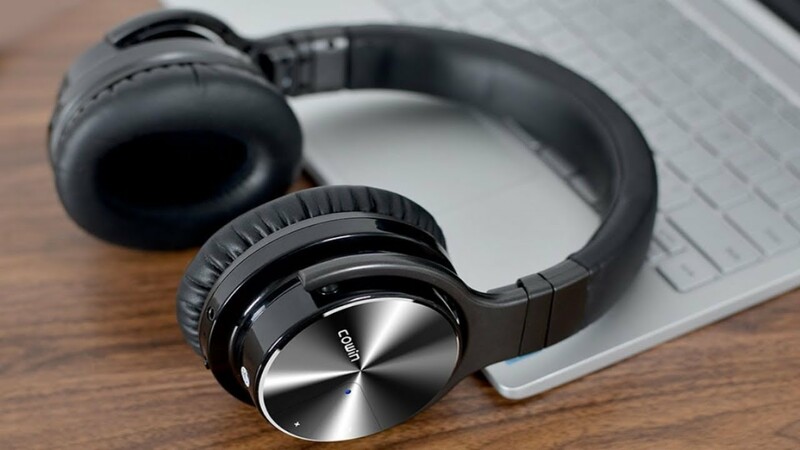 In addition, the thick ear pads also help to attenuate some environmental noise – it combines very well with the active noise cancellation (ANC). 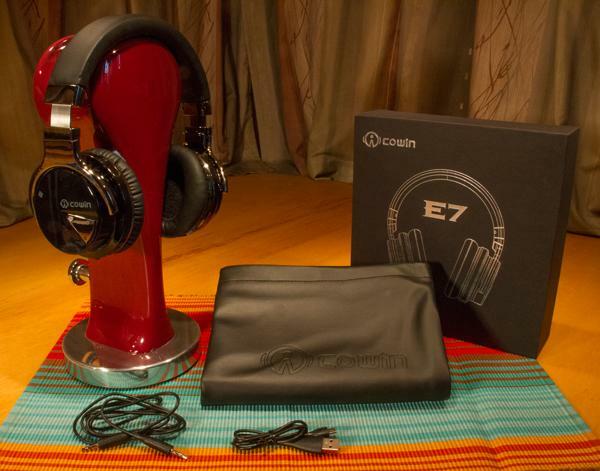 However, just like other closed-back headsets, Cowin E7 can get pretty hot after some time. So, even though the ear pads don’t press on your ears, you may still want to take it off every once in a while to give some air to your ears. Cowin E7 Pro still uses the same ear pads which are incredibly comfy on the ears. The ear pads and soft headband will allow you to wear the headset for a few hours continuously. Some people may notice that Cowin E7 Pro is slightly heavier than its predecessor, but the added weight is not significant. Cowin E7 Pro is still light and very comfortable on your head. Cowin E7 Pro is also a closed-back headset, so it can also become pretty hot after some time. Taking it off every once in a while is a wise idea. 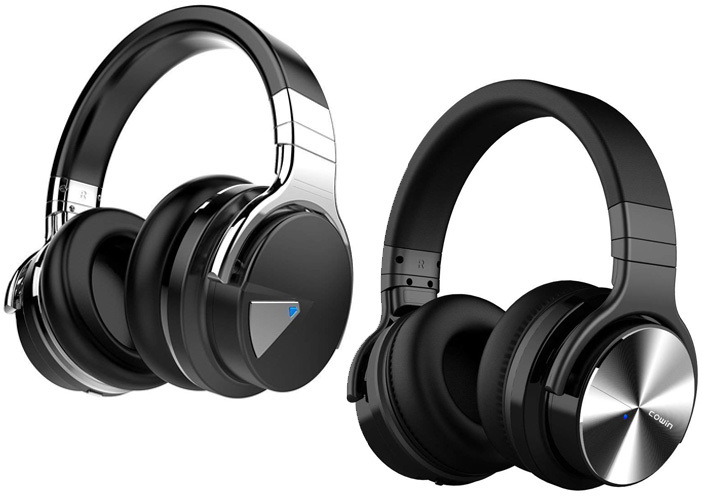 Cowin E7 Pro has a similar layout as its predecessor; it has a Micro USB port for charging on the left ear cup, whereas the aux port and the controls are on the right ear cup. The layout of the controls is quite intuitive to use. On the right ear cup on each headset, you can find a triangle panel on which the controls are located. First, there is a “+” button for increasing the volume or switching the track forward. Second, there is a “-” button for decreasing the volume or skipping the track backward. Third, there is an “o” button for pairing the headset and answering calls. Fourth, there is a power button that also works for turning on/off the Bluetooth and the ANC. Both Cowin E7 and Cowin E7 Pro have built-in Bluetooth and NFC. Hence, you can pair either headset wirelessly to your smartphone, tablet, or other Bluetooth-enabled devices without any problem. The NFC pairing is aided by voice prompts, and it is quick and stable. If you want to save some battery on the headset, you can resort to a wired connection. As mentioned above, each headset here comes with an audio cable. It also allows you to continue listening to your music even when the headset is running out of battery. Cowin E7 vs E7 Pro are similar in terms of ANC performance. One nice thing about these headsets is that you can actually turn on or off the ANC, so you are not stuck to having the headset constantly blocking all outside noise. You can just turn the ANC off when not needed, for example when you are walking outside or driving. When you don’t want to be bothered by the environment, you can turn the ANC back on. Their ANC performance is surprisingly good. They are able to block most conversational noises and engine rumble noises very well. So, these headsets are great for office use and air travel. However, when in a silent environment without listening to any music, you may hear a hissing sound from the ANC instead of total silence. This is quite common in many noise-canceling headsets except the more expensive ones. This is not a big issue. Note that the ANC only blocks background noises and low-frequency noises. In other words, it won’t completely block high-pitches sounds, such as children’s cries, honks, and some machinery sounds. It only attenuates them. Cowin E7 comes with 40mm drivers. It sounds very good. It has nice bass with well-defined midrange and crisp, clear treble. Well, it does not exactly produce audiophile-grade sound, but its sound is definitely enjoyable. Bass-heavy music sounds tight and punchy, and the overall sound character is still quite balanced. Vocals are impressive, with excellent clarity and sound separation. The soundstage is pretty wide, hence resulting in a crystal-clear and lively performance. It is even able to deliver decent quality music at high volume levels without any distortion. Cowin E7 Pro comes with 45mm drivers. If you’ve ever listened to Cowin E7, you may be surprised that Cowin E7 Pro has even better bass performance. It is able to deliver low-frequency sounds and sub-bass very well. The mids are full with energy. Meanwhile, the treble is pretty good, although some high-picthed vocals and synths can become a bit rough. The soundstage, just like the predecessor, is surprisingly wide. It is not as wide as what open-back headphones can offer, but it is wider than expected. The sub-bass, bass, and midrange are nicely separated. It is definitely very enjoyable to hear. Cowin E7 comes with a 600mAh battery, whereas Cowin E7 Pro comes with a 800mAh battery. However, the increased capacity on the new model is for driving the larger drivers. The maximum battery life is still the same, which is 30 hours per charge. Nevertheless, this is a very good battery life. If you use the headset for 4 or 5 hours in a day, the headset can last for about 6 days. You don’t need to worry so much about the charging. Both Cowin E7 and Cowin E7 Pro are equipped with the quick charging technology. They only need to be charged for 10 minutes to get enough juice for 1 hour of playback. - More Stable Battery Life. 30-hour playtime per full charge at Bluetooth mode. A built-in 800mAh battery won't allow your headphones power off, you can enjoy your world without noise for 30 hours' long time. Don't need to worry the power shortage problem on the long travel. 18-month warranty and quick response & friendly customer service. Note: The exclusive authorized seller is COWIN. These two headsets are actually quite similar. The main advantage of Cowin E7 Pro is the larger drivers. It can deliver even better bass and sub-bass. It is still very comfortable, and it has similar battery life. In the end, Cowin E7 Pro is more recommended.